Last summer I heard about Summer Explosives Camp and I thought to myself what was I doing all those years at EFY? Then I learned that it hadn't been available when I was eligible and I felt a little better. When I was at ISU I had an opportunity to go and see the research and development facilities at Thiokol. It was amazing. They talked to us about ammonium perchlorate (NH4ClO4) which is the oxidant that they use for the solid fuel rocket boosters. Because it is water soluble they need to be careful about getting it on their clothing because it will be soaked up and then it will dry in the clothing making the clothes very dangerous. To demonstrate they had a leather boot that they had soaked in a saturated solution for several days. They then allowed the boot to dry thus trapping all of the ammonium perchlorate in the leather. Next they lit the boot on fire starting at the toe. At first it didn't seem like much was happening and then a flame about 4 feet tall shot out of the leg of the boot and consumed the boot. After a few seconds all that was left was the steel toe of the boot. It was very impressive. They stressed to us that rocket fuel isn't explosive. You don't want an explosive fuel. You want a fuel that burns at a steady rate and extremely reproducible. 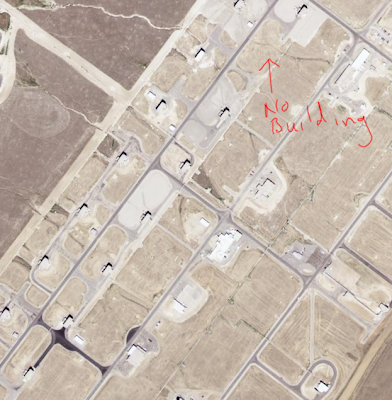 As we were entering a building they had us look out over the facilities and pointed out a two rows of buildings. They were evenly spaced identical buildings with one lot empty. Our guide told us that that was where a fire had broken out while they were mixing the fuel and the building was destroyed. At that point I decided that as cool as it would be to work with high energy materials, it was more important to come home every night. So on to explosives. How can you predict how much energy will be released from a chemical explosion? That is a very difficult question and one that we still can't predict perfectly. There are a few rules of thumb that can get us to within about 10%-20% of the answer. The first step is to know the structure of the explosive. I've shown some common ones below. Once you have the structures you can calculate the oxygen balance. When an explosion takes place the explosive molecule breaks apart into its individual atomic constituents. 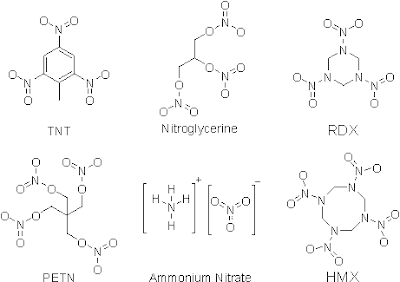 These quickly form several small stable molecules including H2O, CO2, N2, H2, CO, etc. By considering the formulas of the explosives and determining how much oxygen is in the molecule compared with how much oxygen is needed to completely oxidize the fuel present. If there isn't enough oxygen it is called a negative oxygen balance, like TNT. If there is more oxygen than is needed it has a positive oxygen balance, like nitroglycerine. There are tables that list the oxygen balance of different molecules and mixtures but it's easy to do even if you don't have a table. It's easy to determine the oxygen balance if you know the molecular formula. When detonation of HMX takes place the explosive molecule is broken apart and oxidized to form gaseous products. To figure out the oxygen balance we need to assume that the explosive is completely oxidized to form carbon dioxide, water, and nitrogen. last the O. There are several ways to balance the oxygen but we are going to do it by subtracting O2 from the right side of the equation. In order to balance the the formula we had to put a negative sign in front of the O2. That indicates a negative balance, meaning that it takes more oxygen than the HMX has to fully be oxidized to water and carbon dioxide. This amount of oxygen as a weight percent of the total molecule can be calculated by taking the mass of the oxygen on the right side of the equation, -641 and dividing it by the molecular weight of HMX, 2962 all times 100%. (-64/296)∗100%=-21.6%. The oxygen balance doesn't tell us the how much energy will be released from a given molecule or mixture but the strength, brisance, and sensitivity of an explosive or mixture are seem to increase as the oxygen balance approaches zero. Zero oxygen balance also leads to fewer toxic gases released during the explosion. If the oxygen balance is negative CO is formed. If the oxygen balance is high NOx (NO + NO2) is formed. While this isn't a problem if detonating in open air with good ventilation, it is a problem in mines with poor ventilation. So we haven't gotten to the part where we predict how much energy comes from a given explosive but this is enough for this post and the rest will just have to wait. Akhavan, Jacqueline. The Chemistry of Explosives. RSC paperbacks. Cambridge, UK: Royal Society of Chemistry, 2004. @willplay1a Yes you may use the picture if you give attribution. What is the contest? I'd love to see the final entry.